…at least not for readers of this blog. With the holiday season in full swing, I’m just not able to get an informative review of the third segment from Tales From The Third Dimension before Christmas is through. But I thought I should get something up here as a Christmas treat. A few of us might remember when Tim Burton’s A Nightmare Before Christmas got the 3-D conversion treatment a few years back. 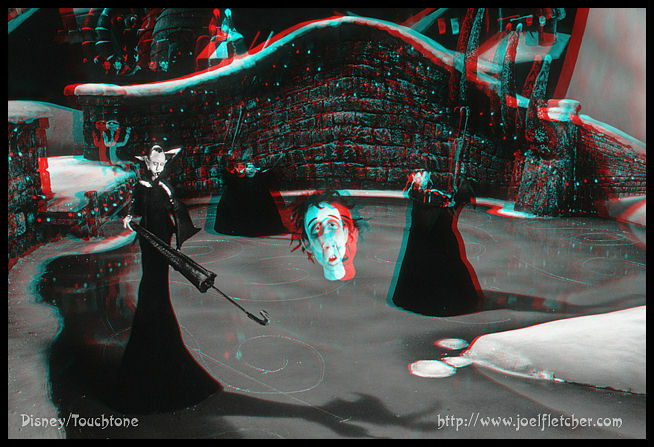 The conversion was adequate but just imagine what it would have been if the film had been shot in 3-D ala Coraline. Well thanks to Joel Fletcher, an animator on the film, we can. A stereoscopic fan he shot 3 dimensional photographs of a number of scenes in the film. They’ve but up on the web for a while now, but if you missed them grab your anaglyph glasses and check out this link.